Eaton C Series 3-Pole Type JD molded case circuit breaker is rated at 225-Amps and 600-Volt AC. The interrupt rating of this circuit breaker is 35-Kilo-Amps. It has dimension of 4.125-Inch x 4.063-Inch x 10-Inch. 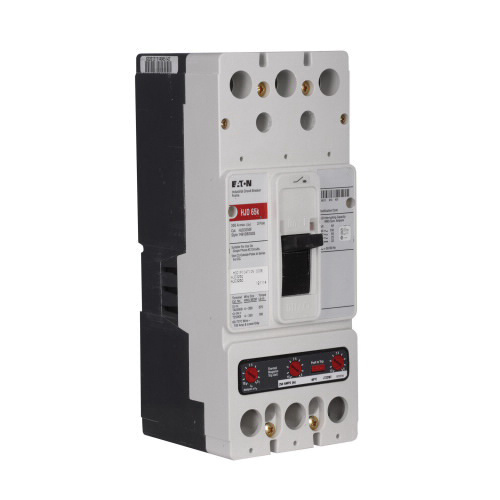 This 3-Phase circuit breaker with line and load terminal connection, employs non-interchangeable and thermal magnetic trip for ensuring reliable performance. This J-frame circuit breaker supports bolt-on mounting, therefore making installation easier. It withstands temperature rating of 40 deg C. This circuit breaker is perfect for use in panelboard, switchboard, motor control center and busway applications for dependable branch circuit protection. Circuit breaker is UL listed and HACR rated.